“What a floozy,” Alice describes herself in one scene. Incidentally, you can also say the same about the movie. Closer flirts unabashedly, with alluring images of intimate interactions and beguiling exchanges of playful (sometimes snappy) bantering. Fast-paced and entertaining, it doesn’t give you time to think, much less question what’s happening on screen. But it’s not like you need to—most of the time you’re enjoying yourself too much to even think about thinking. A casting and editing success, the film possesses an undeniable charisma, an irresistible magnetism that lures you inside its world without reservation—easy seduction at its finest. The movie follows the intertwining romances of four characters: Alice (Natalie Portman), Dan (Jude Law), Anna (Julia Roberts), and Larry (Clive Owen). It shows them grappling with inconstant emotions and struggling to locate meaning in their relationships. But as they weave and unweave the tenuous threads of their affairs, they find themselves drawing dangerously closer to one another, eventually losing themselves as they deal with inevitable departures. 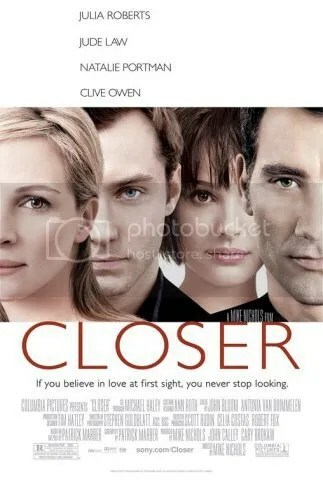 Essentially a series of heartbreaks, Closer makes use of several lines made familiar by other romances. But although tacky when taken out of context, these lines found fitting places in the movie’s script. In those scenes, at those times, from those characters, they did not seem at all trite. Instead they resonated with emotion, made perfect sense in those situations. Besides Roland Barthes’ A Lover’s Discourse: Fragments, I have never seen or heard so many heartrending statements anywhere else. My heart broke at almost every scene. I died with almost every line. What makes the dialogue work so well is the emptiness of the characters—mere vague silhouettes, really. We hardly know anything about them, so we get to impose ourselves: make choices along with them, fight for them. It’s what makes the film so difficult to assess, because at some point a part of you gets pulled into it so deep it’s hard to see anything else. But towards the end I caught sight of a chink in its near-impenetrable armor. Frivolous might be too strong a word, but I found that in this movie “love” is a word bandied around too carelessly. And though it had me hooked for the most part, the last ten minutes shattered whatever illusions I might have had about it. It was just one change of heart too many. This entry was posted in Drama, Film and tagged Clive Owen, Closer, Jude Law, Julia Roberts, Mike Nichols, Natalie Portman on January 20, 2011 by Michelle.